Who wouldn’t want to own a motorcycle that belonged to Steve McQueen? One of the coolest men ever to grace the big screen, McQueen was the star of such iconic classics as The Great Escape, Bullitt, The Magnificent Seven, The Getaway, and the original Thomas Crown Affair. McQueen was not only a film legend, but was also an accomplished motorcycle and car racer. The popular 1960s documentary, On Any Sunday, features him, talks about some of his motorcycle racing, and his love for motorcycles in general. 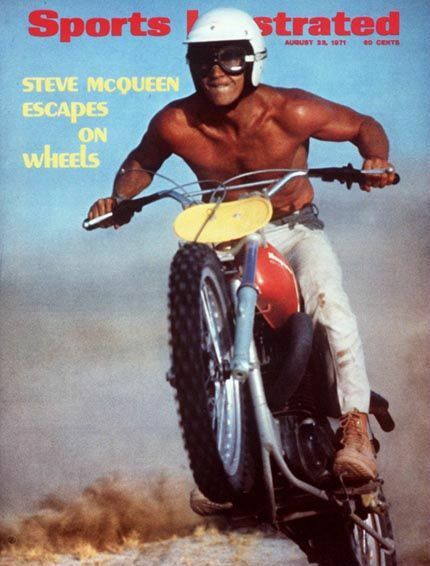 At the time of his death in 1980, McQueen owned over 100 motorcycles. Call for consignments announced for third annual motorcycle auction. Following Bonhams’ highly successful inaugural motorcycle sale in Las Vegas earlier this month – where approximately 200 motorcycles brought buyers and sellers together from around the world for a sales total exceeding $2.5 million, the world’s leading auctioneers of motor vehicles is proud to announce its third annual auction at the Quail Motorcycle Gathering. Hosted on May 14th at Quail Lodge in Carmel, California, Bonhams’ sale of “Exceptional Motorcycles & Related Memorabilia” will include what is understood to be the very motorcycle featured on the front cover of the August 1971 issue of Sports Illustrated being ridden by none other than “The King of Cool,” Steve McQueen. The 1971 Husqvarna 400 was originally purchased from the Steve McQueen Estate Sale in 1984 at Harrah’s Auto Collection in Las Vegas, the very locale where Bonhams’ recent motorbike sale was conducted. In addition to its title of former owner, authentic documentation and immortal association, the Swedish-made dirt bike – which son Chad McQueen reportedly said was his father’s favorite off-road brand – comes with a wooden trunk of accessories as owned by McQueen. Other McQueen ephemera will be offered at the sale including numerous racing trophies won by this legend of the silver screen. Last year’s sale at Quail Lodge saw a rare 1910 Royal Pioneer Single sell for $92,000, the only known surviving 1914 Flanders Model D Twin – , formerly owned by L.A. newspaper scion Otis Chandler – , gosell for $78,200, , and a pristinely restored 1913 Flying Merkel Single Board Track Racer sellgo for $64,975, to name just a few couple. Additionally, bikes of pedigree were on offer, including the ex-Rody Rodenberg factory-modified 1940 Triumph T100 Tiger Competition and a 1972 Harley-Davidson XR 750 TT, famous as the model that legend Cal Rayborn used to vanquish many a competitor. For photos and press inquiries, please contact press@dravcarn.com.